The MNB centralised the figures provided by 23 insurers, including six life insurance companies, nine non-life insurers, and eight composite insurers. Data show aggregate pre-tax profit of HUF 77.75 billion in 2018 (EUR 240 million), up by 13% y-o-y, while after-tax profit was up by 12.6% to HUF 72.87 billion (EUR 226 million). Per insurance lines, life insurance GWP was up by 3.5% y-o-y to HUF 476.7 billion (EUR 1.5 billion), while non-life policies generated the remaining HUF 547.3 billion (EUR 1.7 billion), or 10.5% more y-o-y. Incurred claims (payments and reserves, summed) totaled HUF 364.1 billiom (EUR 1.1 bilion) for life insurance contracts, and HUF 232.9 billion (EUR 724.5 billion) for non-life contracts last year. The presented amounts were down by 0.1% y-o-y and up by 2.4% y-o-y, respectively. The number of insurance contracts was up 3.64% in 2018 compared to 2017, at 13,917,575 million. There were 2,390,969 million life insurance contracts, down by a marginal 0.1%, and 11,526,606 million non-life contracts following a 4.4% rise. 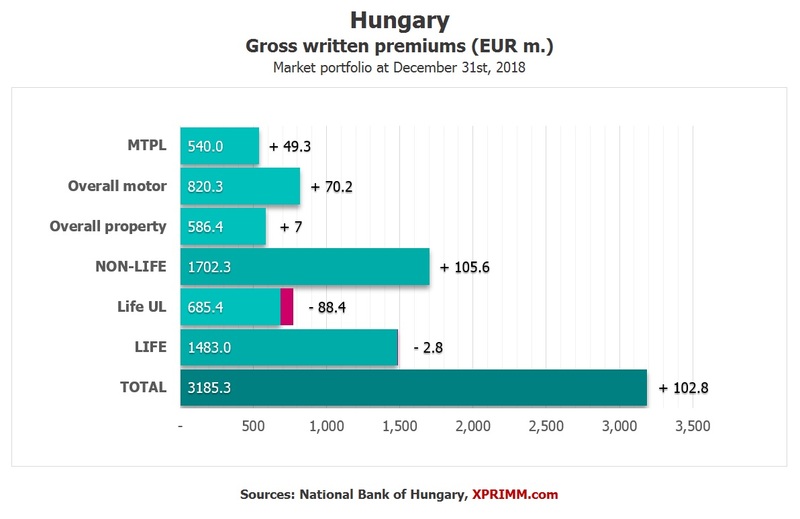 Access www.xprimm.com and download the FY2018 Hungarian insurance market statistics.